It is conveniently located, accessed by a small drive way, air-conditioned and just a short walk (via a small track) from Gaios central square, the beach, restaurants and all local amenities. It is only a few meters away from the famous Venetian Cistern (Sterna) on the slops of a hill and at the back of Agii Anargiri church. Avgi Apartment One consists of a simple lounge / dinning area with sofa bed, which can be converted into a third bed, kitchen, shower room, a double bedroom and front balcony with stunning views over the bay. There is a communal patio area and at the entrance of the building a courtyard. 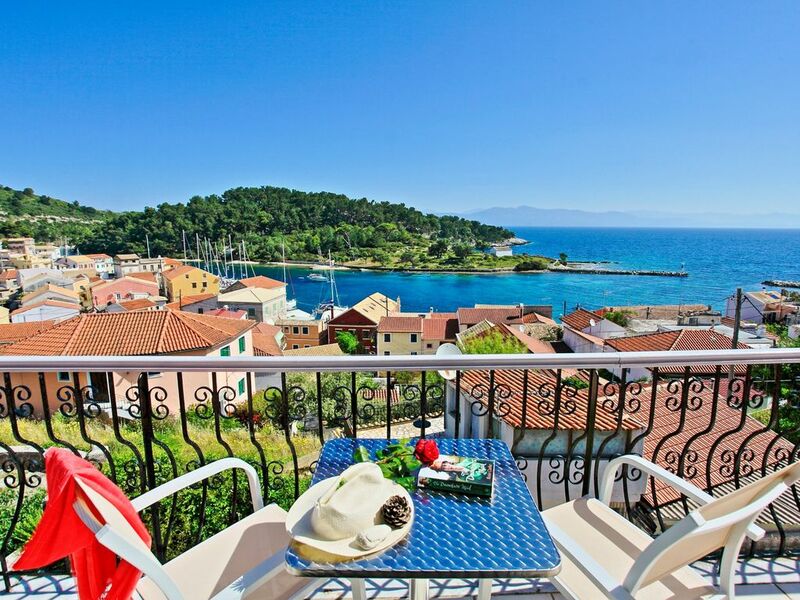 The ideal location, the amazing views and the facilities offered, make Avgi Apartment One an ideal place for a relaxing and unforgettable holiday in the cosmopolitan island of Paxos. Well situated apartment set back but with easy access to the town centre. Well situated apartment set back but with easy access to the town centre. Beautiful views from the balcony over the harbour and across to Albania. We thoroughly enjoyed watching the boats coming and going - take binos! Has a very comfortable bed too!The office staff couldn't have been more helpful, taking us to and from the ferry and especially, when one of us was poorly,arranging and bringing the doctor. Nice apartement, with great view over Gaios. Fresh and clean rooms. Only mishap was lack of WiFi and when delivered, just worked on balcony. I appreciate your positive feedback about our property and thanks very much for your time to review. We do take pride in catering to our guests' needs the best way we can. If you're travelling to our area another time, do not hesitate to contact us and we are sure we will find you again the best solution for your needs. Until then, I wish you a wonderful time and all the best. Major Credit Cards Accepted and Bank Transfer - 10% deposit required upon confirmation.